Ever get tired of searching for the same things over and over again? We’ve added a way for you to save your searches so you don’t have to. 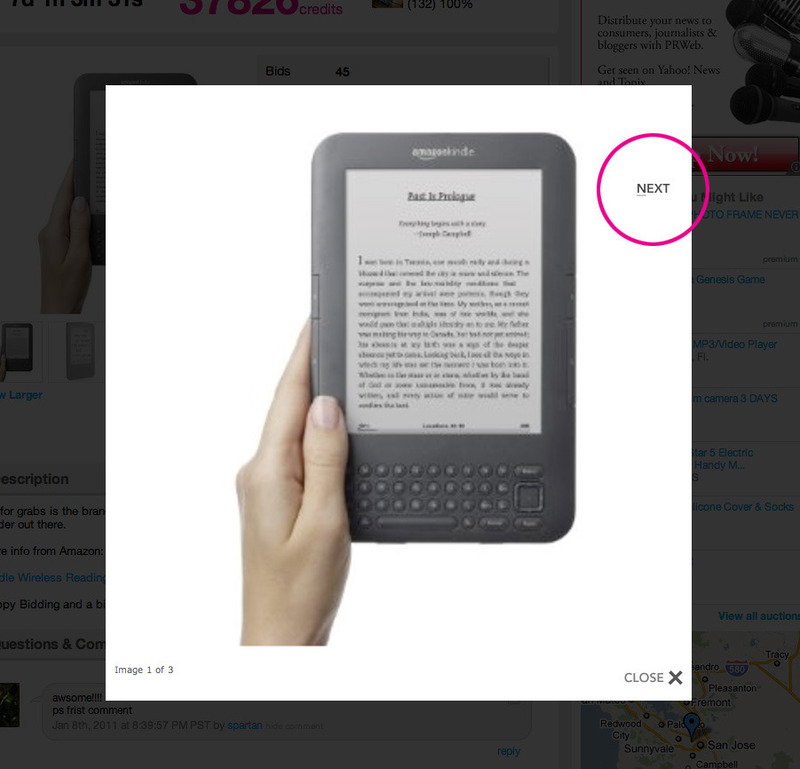 Along with this, you can be notified via email when new auctions are found with your search. Emails are sent once a day and you can always turn notifications off. To save a search look for a link next to the number of search results called “save search”. When you click this you’ll be prompted to name your search so you can reference it later on and you can also choose to receive email notifications or not. In “My Listia” there is a new menu under “Account Settings” titled “Saved Searches” and here you can manage your settings as well as view results from your searches. There is currently a maximum of 5 saved searches. Enjoy! We decided to use a light weight image gallery for viewing larger images and we decided to utilize Slimbox2 for the time being. Down the line we may eventually build our own way to zoom even further, but for now this light weight lightbox does a nice job. To view larger images click the “View Larger” link on any auction page that has photos uploaded. One thing you may not know is that you can flip through the images by clicking “Next” and “Prev” buttons that appear when you mouse over the side of the image. This is much easier than closing the lightbox then opening up another image. Enjoy! As the number of web browsers increases so do your choices on which one you use. With the slow and gradual death of Internet Explorer 6 (thank heaven) there comes a whole slew of new IE versions (7, 8 and now 9 beta). Then throw in Firefox, Google Chrome and Safari … feels like you’re at Home Depot picking out what shade of blue to paint your room. To some of our users the choice may just be “what came with the computer”, but everyone should be open to try new things. After taking a look at some of our statistics we were happy to see that less than 1% of our users use IE6 (thank you to those of you that have moved on). BUT there are still quite a few of you out there using IE 7, 8 or 9 (we didn’t even know about 9 until we saw some stats). This wasn’t too shocking to us since IE still has a tight grip on a lot of people, but at the office you’ll never see anyone using IE unless it’s to do browser testing. Chrome looks like the blatant winner on this test suite. That conclusion probably is consistent with a lot of other test suites out there, but we thought we just had to see it for our own eyes. Never heard of Chrome or Firefox? Click the links to check them out, but basically they’re alternatives to using Internet Explorer to browse the web. Download them and see if you like em … we do! We hope everyone has been having a great 2011! We’ve been cranking away at a lot of new features and here is our first one for 2011, Listia Perks! Jump to this link if you want to read about it on your own. You can find the link to perks on the left hand side of “My Listia” under “Account Settings”. When a perk is activated you will have the ability for that perk immediately. 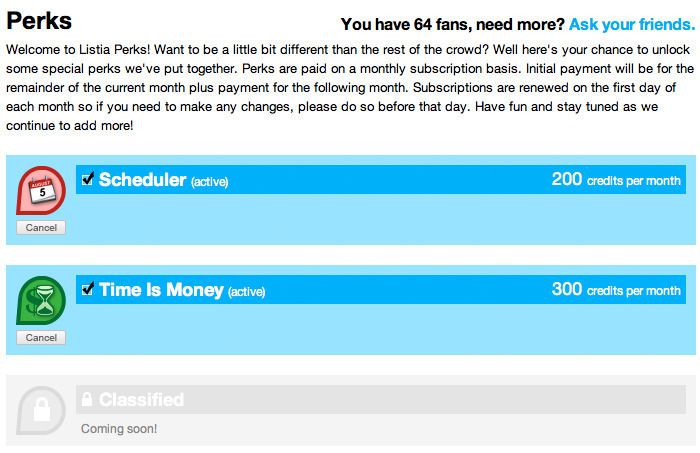 You activate and subscribe to perks based on a monthly subscription plan and they are renewed on the first day of each month. To activate a perk, the initial cost is a prorated number of credits for the remaining days in the month as well as payment for the next month. At any time you may cancel your subscription and you will have the ability for that perk until the next renewal period when your subscription is canceled. When you activate a perk you will receive a badge for that perk indicating that you have that perk activated. If you decide to cancel a subscription that badge will be removed on the next renewal day. Each perk will have a different set of requirements to unlock it. Some of you may already have them unlocked and others might need to put in a little work. One last thing … pricing of perks is subject to change, but if you subscribe to a perk at a cheaper price you will be grandfathered in forever unless you cancel that subscription. As time goes on we’ll be adding more and more perks, but not always with an announcement, so keep your eyes peeled! Have fun!